Penn State University and University of Chicago researchers say an accidental discovery of a “quantum Etch-a-Sketch” may lead to a new way to use beams of light to draw and erase quantum circuits, and that could lead to the next generation of advanced computers and quantum microchips. The new technique is based on “topological insulators” (a material that behaves as an insulator in its interior but whose surface contains conducting states, meaning that electrons can only move along the surface of the material). The electrons in topological insulators have unique quantum properties that many scientists believe will be useful for developing spin-based electronics (such as disk drives) and quantum computers. However, making even the simplest experimental circuits with topological insulators has proved difficult because traditional semiconductor engineering techniques tend to destroy their fragile quantum properties. Even a brief exposure to air can reduce their quality. The researchers have now discovered a rewriteable “optical fabrication” process that allows them to “tune” the energy of electrons in these materials using light instead of chemicals — without ever having to touch the material itself. They used this effect to draw and erase one of the central components of a transistor — the p-n junction — in a topological insulator for the first time. Curiously, the scientists made the discovery when they noticed that a particular type of fluorescent light in the lab caused the surface of strontium titanate (the substrate material on which they had grown their samples) to become electrically polarized by ultraviolet light. The room lights happened to emit it at just the right wavelength. It turned out that the electric field from the polarized strontium titanate was leaking into the topological insulator layer, changing its electronic properties. They found by intentionally focusing beams of light on their samples, they could draw electronic structures that persisted long after the light was removed. “It’s like having a sort of quantum Etch-a-Sketch in our lab,” said said David D. Awschalom, Liew Family Professor and deputy director in the Institute of Molecular Engineering at the University of Chicago. They also found that bright red light counteracted the effect of the ultraviolet light, allowing the researchers to both write (with UV) and erase (with red light). To test whether the new technique might interfere with the unique properties of topological insulators, the team measured their samples in high magnetic fields. They found promising signatures of an effect called “weak anti-localization,” which arises from quantum interference between the different simultaneous paths that electrons can take through a material when they behave as waves. 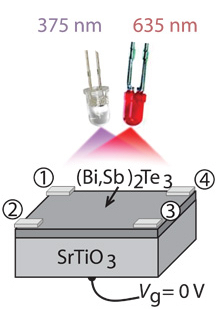 To better understand the physics behind the effect, the researchers conducted a number of control measurements, which showed that the optical effect is not unique to topological insulators; it can also act on other materials grown on strontium titanate. The research was published October 9, 2015 in an open-access paper in a new AAAS journal, Science Advances.